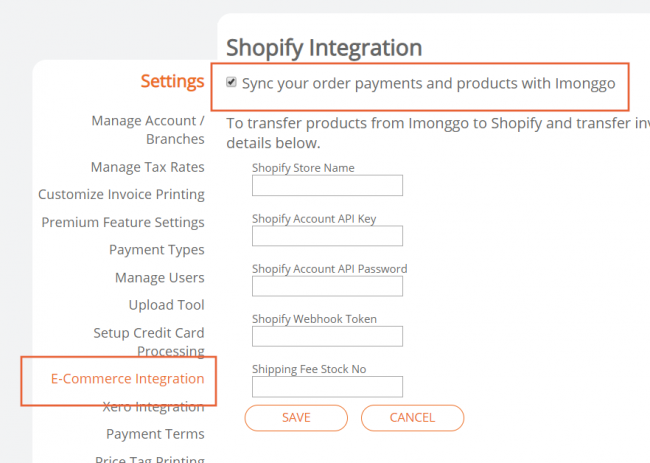 Imonggo’s new integration with Shopify lets you sync your inventory between your point-of-sale and your e-commerce website. With this new Imonggo feature, you can decide what products in Imonggo are available for sale in your Shopify store. You may also send the sales you made on Shopify to your Imonggo account so you have a holistic view of your sales totals across the two services. 1. First, go to the E-Commerce Integration page in your Imonggo account’s Settings. Don’t know how to get to Settings? Just click the gear icon on the upper right. 2. 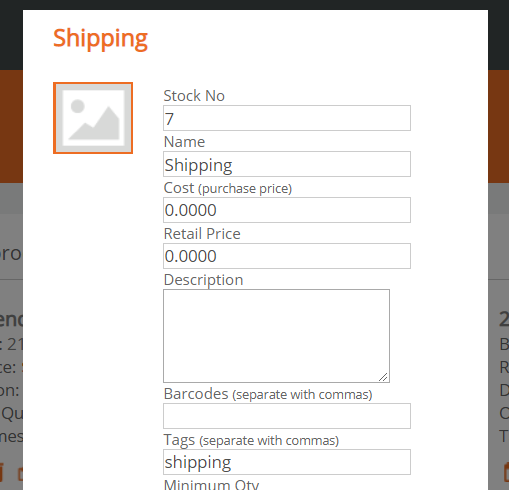 Add a checkmark beside Sync your order payments and products with Imonggo and click the Save button. As you can see above, there are five fields you need to fill up. Click the tabs below to learn how to get these information. Please accomplish the tabs in order. This one is the easiest to fulfill. To get the Shopify Store Name, just go to your Shopify account and copy the name of your store as it appears in the browser’s address bar. For example, our test store’s name is faster tech, but it appears as faster-tech on our browser’s address bar. 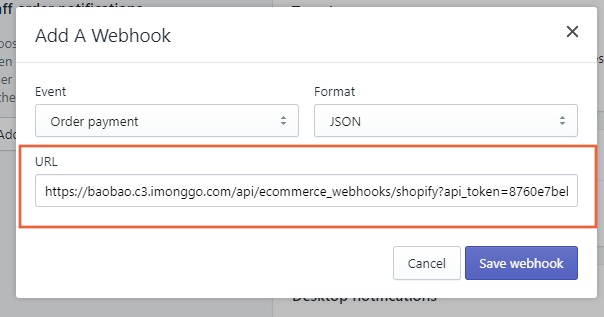 Just copy how it appears on the URL (do not include myshopify.com or the rest of the URL) and paste it onto the Shopify Store Name field in Imonggo. Go to the next tab to get the Shopify Account API Key. 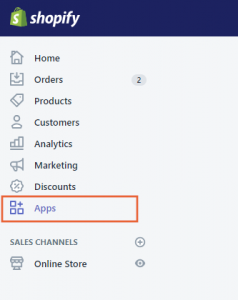 Follow the steps below to get the Shopify Account API Key. 1. Go to the Apps page on your Shopify account. 2. 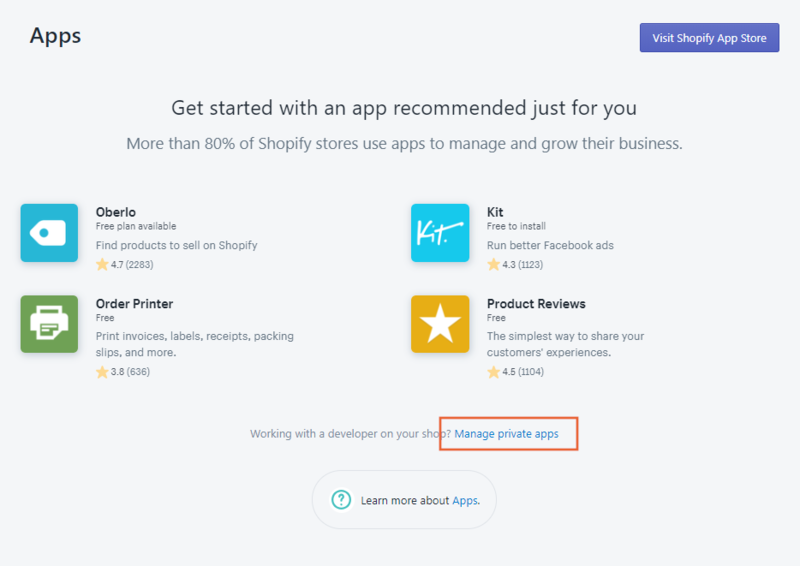 Click the Manage private apps link near the bottom of the Apps page. 3. In the next page, click the Create a new private app button. 8. The second section, Admin API, is a bit complicated, so please tread carefully. You have to copy the API key and the Password and paste them into the E-commerce Integration page in your Imonggo account. b. 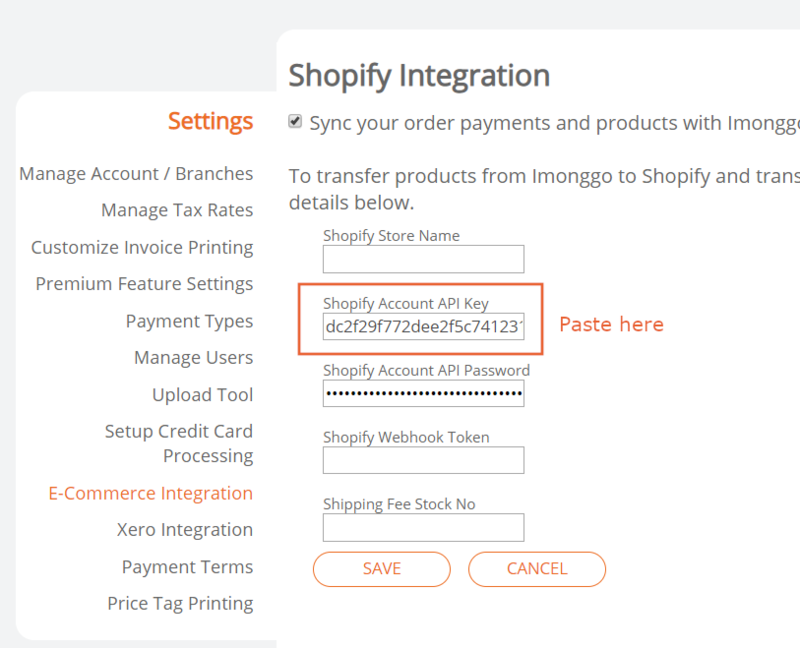 … and paste it in the Shopify Account API Key field on the Imonggo E-Commerce Integration page. Go to the next tab to get the Shopify Account API Password. Please accomplish the last tab first before proceeding with this one. d. … and paste it in the Shopify Account API Password field in Imonggo. e. Then click the Save button in Imonggo. 8. Go back to Shopify and scroll down to the Admin API Permissions part of the Admin API section. 9. Then scroll to the last section of this page, called Storefront API. Leave it unchecked. Then click the Save button at the bottom right. 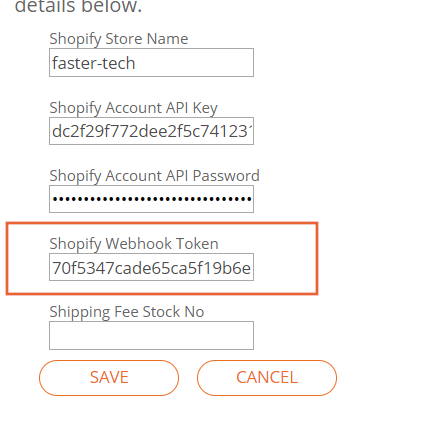 Go to the next tab to get the Shopify Webhook Token. The Shopify Webhook Token can be found in Shopify. First, go to Shopify’s Settings (the button is on the lower-left corner) and click Notifications. 2. Then scroll to the bottom to find Webhooks section. Highlight the Token and copy it. 3. Then paste the Token onto the Shopify Webhook Token in Imonggo. This is not yet the end of the Webhooks settings. Please go back to Shopify to create two Webhooks. 6. 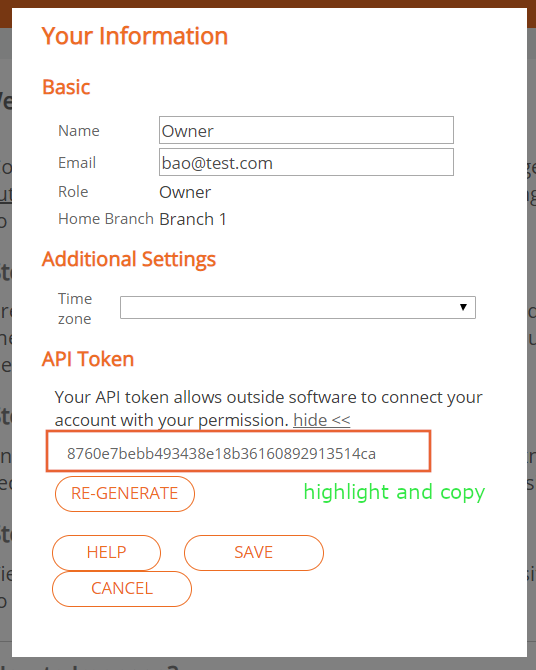 Now, the [imonggo_account_api_token] can be taken in the Home page of your Imonggo account. How can you go to Home? While logged in to your Imonggo account, click the Imonggo logo on the upper right of the screen. 7. Then once you are in Home, click My Info on the upper right. 8. This should open the Your Information window. Near the bottom of that is the API Token. Highlight it and copy. Now that you have your Callback URL, you may now go back to Shopify to create two Webhooks. 10. Go back to the Webhooks section of the Notifications page of Shopify’s Settings. 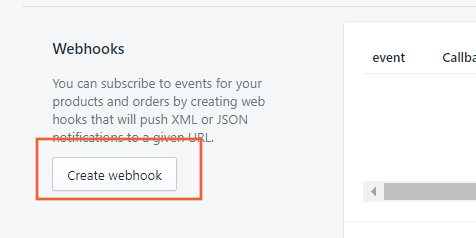 Click the Create webhook button. 11. Create the first webhook, which would be for your invoices. Under Event, please choose Order payment. Leave the format as JSON. 12. Under URL, paste the Callback URL that you created earlier. Then click the Save Webhook button. 13. After saving the first webhook, click the Create webhook button again to create the last required webhook. 14. At the webhook creation dialog, choose Product creation under Event. This should allow you to send your products from Imonggo to Shopify. Leave the Format as JSON again. 15. Then paste the Callback URL again in the URL field. Click Save webhook to save it. 16. That should do it! Now you have the proper webhooks for you Imonggo account. Now you can move to the last tab, which will allow you to get the Shipping Fee Stock No. Getting the Shipping Fee Stock No should be easy. First, create a product in Imonggo that will stand as the Shipping item. You may assign the cost and price to be zero, because you may change it on the fly in Shopify. What’s important here is the product’s stock number. 2. 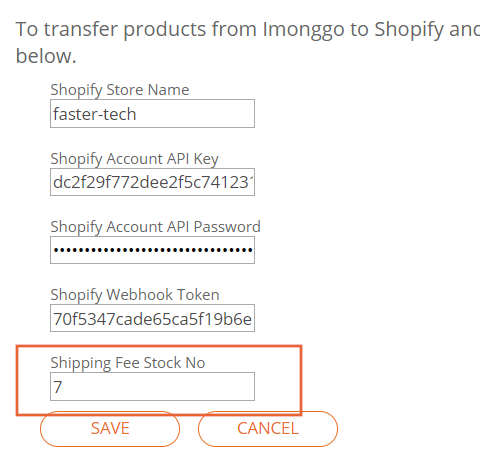 Copy the stock number of your Shipping product and paste it onto the Shipping Fee Stock No field in the E-Commerce Integration page in Imonggo’s Settings. 3. 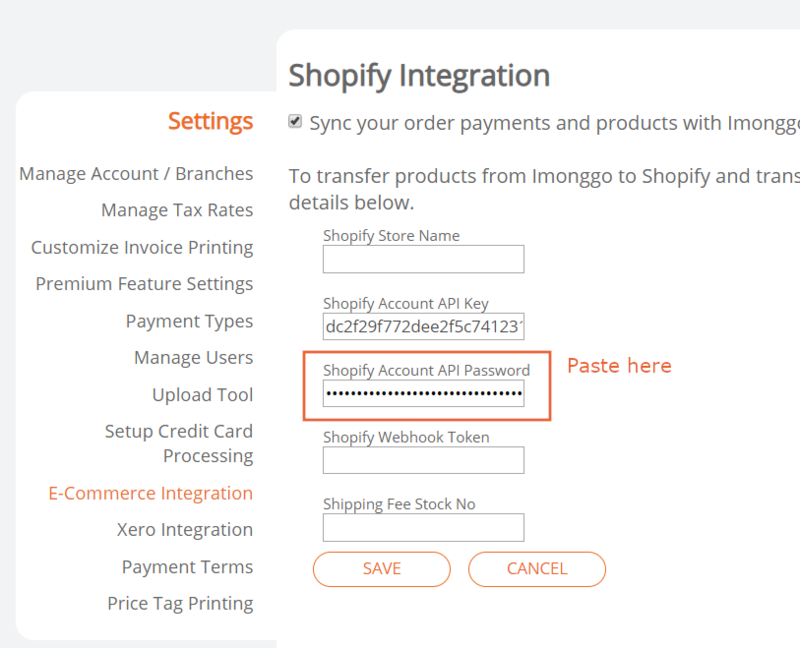 Then click the Save button to finalize the integration between your Imonggo account and Shopify. That’s it! You may now use Shopify with Imonggo.